One-way, mutually constitutive, or two autonomous spheres: what is the relationship between research and policy? Academics are increasingly exhorted to ensure their research has policy “impact”. But is this ambition predicated on an overly simplistic understanding of the policy process? Christina Boswell and Katherine Smith set out four different approaches to theorising the relationship between knowledge and policy and consider what each of these suggests about approaches to incentivising and measuring research impact. 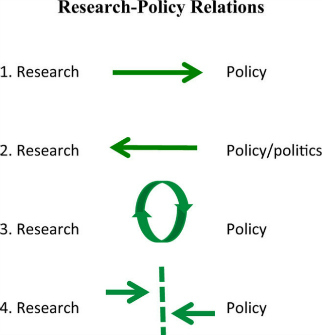 This blog post is based on the authors’ article, “Rethinking policy ‘impact’: four models of research-policy relations”, published in Palgrave Communications (DOI: 10.1057/s41599-017-0042-z). Featured image credit: Dmitri Popov, via Unsplash (licensed under a CC0 1.0 license). Christina Boswell is Professor of Politics at the University of Edinburgh, where she currently serves as Dean of Research for the College of Arts, Humanities and Social Sciences. Her new book, Manufacturing Political Trust: Targets and Performance Indicators in Public Policy, was recently published by Cambridge University Press. Katherine Smith is a Reader in the School of Social and Political Science at the University of Edinburgh, where she currently serves as Director of Research, Director of the Global Public Health Unit and Co-Director of SKAPE (the Centre for Science, Knowledge and Policy at Edinburgh). She is also currently Co-Editor-in-Chief of Evidence & Policy and co-edits a Palgrave Studies in Science, Knowledge and Policy book series.